The "if" that's driving stock market higher; time to diversify? Home » The *if* that’s driving stocks higher; how long can it last? It has become a beating drum; the Federal Reserve holds a meeting, and an official emerges with a proclamation that Quantitative Easing will soon be phased out. The consequences of QE’s termination could be dire – as the engine backing the stock market’s growth over the past five years, an end to QE could be catastrophic for your stock portfolio. Fortunately for stock holders, it has been one empty statement after another. Quantitative Easing continues to flood the economy with 85 billion new dollars each and every month, and stocks have been a key beneficiary as they ride the surge of liquidity to new heights. *If* this. *If* that. It’s one after another. Fortunately for stock holders, the *if’s* haven’t won out yet, so Quantitative Easing continues on and on. But do you really want to base your savings on *if’s*? Eventually the *if’s* will fall into place. Quantitative Easing will end. And many experts expect stocks to fall as a result. If your portfolio is based solely on the *if’s* of a stock market being propped up by the Fed, it’s time to diversify into Gold and Silver. Because even just a small portion of your portfolio in precious metals is more protection than you’re going to have with an *if*. Risk of a downside overshoot in stocks? 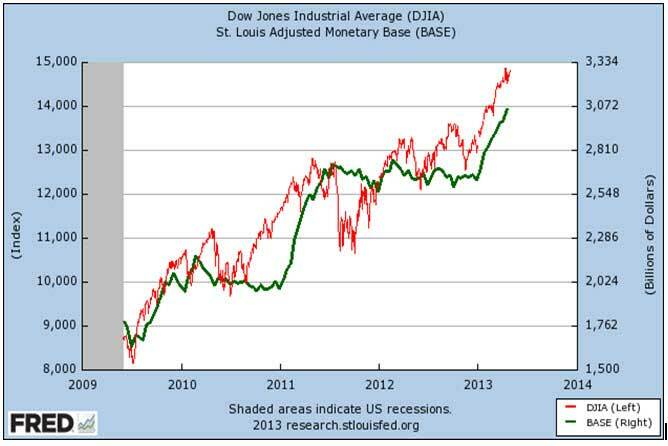 Growth of stock market matches money printing almost perfectly. So what would an end to Quantitative Easing mean for stocks?